Hello all! Just here to give you the latest update on my adventure! I am now in Lagos de Moreno, which is a few hours northeast of Guadalajara in the Mexican state of Jalisco. As usual, much has happened since my last note. Once I was kicked off of the computer that I was using in the hotel in Zacatecas (for not being a customer) I set off to find a place to sleep. After about two hours of searching, I was able to find a nice little cow pasture a few kilometers outside of the downtown area. Since it had been raining all day, I was hoping that it would clear up in the night so that I wouldn´t have to be soaking wet. No such luck. By the time I woke up, everything was wet. Sleeping bag, cot, pack, everything. Grumbeling soggily, I packet up my soaked things and set off. I walked for about two hours along the freeway in this nasty, heavy mist rain. Finally, a guy (who was a flower delivery man) picked me up and took me about twenty kilometers. After that, my day began to get better. About fifteen minutes after Flower Guy dropped me off, a group of people consisting of three women and a young boy in a white pickup stopped for me and took me to the next town down the road, Villanueva. After dropping me off at the end of town, I stopped at a Pemex (the only type of gas station that there is in Mexico) and got some fresh water. After setting off again, I was able to get another ride in about five minutes, again in the back of a pickup. Thankfully, the rain gods had grown tired of soaking the earth, so at least I was starting to dry out a little bit. The pickup took me about thirty kilometers, and dropped me off in the middle of nowhere. The good thing about hitching it in the middle of nowhere is that people see you way out there and they think, well, theres someone who really needs a ride. Consequently, I got a ride with the next car that came by. Ít was a family of three, a father, mother, and a daughter of about eighteen. They took me about forty kilometers and gave me two hundred pesos! (about twenty dollars) I used this to gorge myself on Pemex snacks, and, once I got into the next town (Jalpa) to get a beer and a pack of smokes. A few rides later, at about four o´clock, I was in the tiny town of Moyahua. Feeling the pangs of hunger and that roughly one hundred and seventy five pesos burning a hole in my pocket, I stopped at a roadside restraunt and got three burritos (mystery meat) and another beer. One thing I love about Mexico, everything is DIRT cheap. Those three burritos and a beer cost me thirty five pesos…three-fifty. Once leaving Moyahua, I was able to hitch a ride all the way to Guadalajara with a funny little man named Jesus…no not the Messiah. He was on his way the Guadalajara to go to a funeral of some sort. He chain smoked Marlboros and talked about working in the United States. Once we got to Guadalajara, he drove through this shady part of town where there were people on the side of the street shouting`Medicina!` to passing cars. Apparently, they sell all sorts of perscription drugs for next to nothing on the street, and it is perfectly legal. Jesus bought eight pills of Cialasis, citing the fact that `he was getting old.`I found this privatly hilarious. Once getting dropped off, I proceeded to try to find a place to sleep in the busteling city. Deciding to walk until I found some sort of relitively private field or something, I followed the main road (Av. Relovution) until I finally reached the freeway leading to Mexico City. This took roughly three hours. However, when I reached the freeway, I found the outskirts of town just as populated as the rest of it. I scouted several vacant lots, turning them all down because of excessive litter and chest-high grass. Finally, I saw I promising place, a field around a church. the only problem was, there was a fifteen foot fence all around it, with barbed wire at the top. 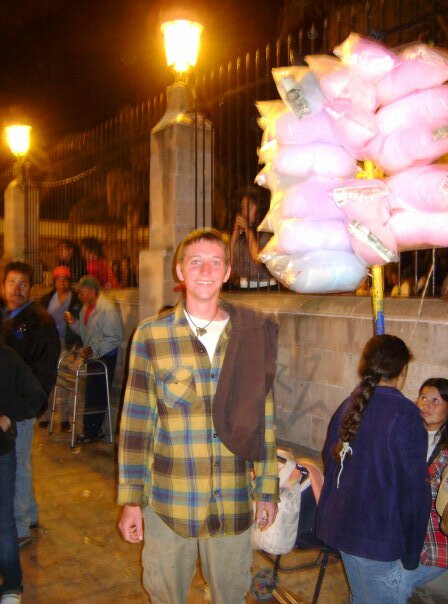 This was my first tip that this wasn´t the best part of Guadalajara for a gringo to be wandering around in at night. My next tip was the excessive graffiti, and my last tip was the sound of gunfire. Well, I thought it was gunfire, but I later learned that it was fireworks (apparently, every day in Mexico is a day worth celebrating) After trying unsucessfully for about half an hour to find a way into the church lot, I settled on a almost as good place…an old, abandoned semi-truck trailer junkyard. I darted through a hole in the fence, made camp under an old trailer, and was lulled to sleep by the sound of popping firecrackers. Or maybe shotguns. The next morning, I was awoken by the sound of voices. I realized with a lurch that maybe this junkyard wasn´t so abandoned after all. Not twenty feet from me was a few people working on the engine of a semi. I lay perfectly still for a solid hour, willing myself to be part of the grass. Finally, the men cranked up the semi and drove off. I packed up camp as quickly as I could and hightailed it out of there before they could come back. After walking along the freeway for about thirty minutes, I was picked up by a younger guy named Alejandro. He told me he love to hitchhike, and that he couldn´t pass up the oppertunity to pick me up. he drove me about fifty kilometers, gave me his email, and was off. I walked for another hour before I was picked up by a car with Illinois plates containing a guy named Angel. He was from Chicago, heading to Lagos de Moreno to visit his mother, and agreed to take me there and let me use the shower, since I was smelling quite rank by now. We arrived, I bathed, ate some burritos, and had a smoke. It was a bright and sunny day and very warm out, so Angel and I decided to go for a swim in the local pool. Finding it suprisingly warm, we chilled there for about four or five hours. Afterward, we went and got some delicious Mexican seafood and drank some wierd tasting beers. Upon our return to his home, he offered a bed (a REAL bed) so as I could recharge after my travels, and I thought, why the hell not. I needed some good REM sleep undisturbed by fireworks or rain. So that evening in the downtown, there was a HUGE celebration in honor of the Lady of Guadalupe or some lady like that, and there was a big party in the streets. 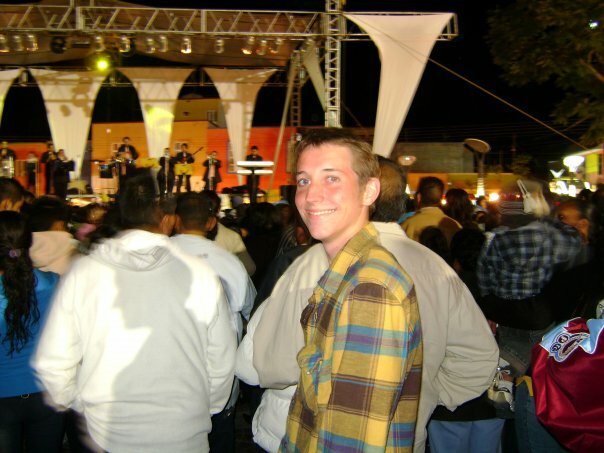 That´s what I love about Mexico…Tuesday night, and everyone´s out until 2 AM using the church as an excuse to get sauced. There were venders all around the city square , selling everything from food to trinkets to little whistels that you put in your mouth that made you sound like Daffy duck. There was even a stand selling ripped DVD´s (everything from old movies to unreleased pictures like 2012 and New Moon) for about twenty pesos each. So illegal, I´m sure. 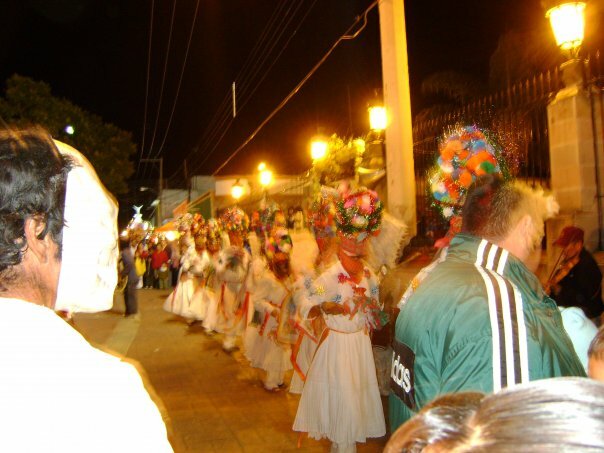 Later, there were traditional Mexican dances where people had extravagent costumes and wore masks. Loud, live bànde music played loudly throughout the celebration, and people danced the night away. Around eleven thirty, they set off this HUGE grand fireworks celebration, launching off things that looked like morters and sounded just like them high into the sky until they exploded with sonic booms into exciting and colourful shapes. Then, they had this big tower that was all wired with fireworks, and when they set it off, the shapes of doves, cups and chalices, butterflies and even a pecock that unfurled it´s tail upon being set off spun around in the air fueled by whisteling little rockets. Once the tower was done, there was the grand finale, where they set off about twenty five different fireworks into the sky at once, sounding like WWIII and sending sparks and bits of flaming paper showering down on to the massive crowd, who scrambled around like ants in a rainstorm trying to avoid being set on fire. Then it was over, and I wittnessed the sight of about ten thousand people trying to leave a relatively small city square all at once. Bottelnecking to the max. Now I remain in Lagos for the rest of today, getting some high quality R&R. Tomorrow, I set off for Uraupan, Acapulco, and Oxaca. I hope to cross the border into Guatemala in one to two weeks. Wish me luck traveling in the dangerous Central America, and I shall write a new note in three to eight days, depending on whatever.